Cancer is a word that inspires intense feelings of fear, uncertainty, and hopelessness. Yet, thanks to increased awareness, early detection, and improved treatment options, cancer deaths in the United States of America have declined significantly in recent years. It’s time to bring this same narrative to Africa. 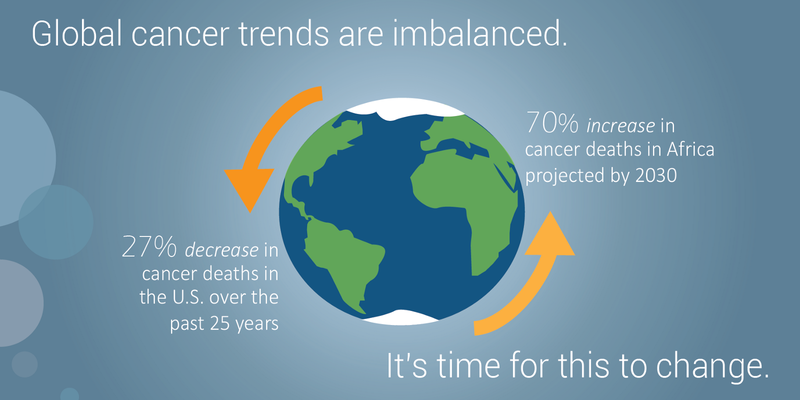 Cancer now easily outpaces malaria as a leading cause of death on the African continent. African women experience a higher burden of the more deadly form of breast cancer and fall ill at a much younger age than women of other ethnicities. African men are disproportionately impacted by prostate cancer and have poor treatment outcomes. Cervical and liver cancer rates are 300% and 50% higher, respectively, in Africa than in the USA. According to the International Agency for Research on Cancer, these four cancers combined were responsible for more than one-third of all cancer deaths in Africa last year. Without prompt intervention, the number of Africans dying from cancer annually is expected to double in twenty years. While many complex and interrelated factors contribute to Africa’s cancer crisis, access and affordability are consistent themes that impede patients at every step along the spectrum of care. In particular, the high costs of diagnostic tests and pharmaceutical treatments are often insurmountable to patients residing in a region where 40% of the population lives off of less than $2 per day. BIO Ventures for Global Health (BVGH) launched the African Access Initiative (AAI) to spur sustainable access to affordable and safe cancer drugs. Driven by Africa, for Africa, AAI engages pharmaceutical and biotechnology companies, African governments and hospitals, and leading cancer centers to improve cancer patient outcomes in Africa. Working in Cameroon, Côte d’Ivoire, Kenya, Nigeria, Rwanda, and Senegal, AAI is establishing new models that ensure affordable, safe, and sustained access to essential cancer medicines and technologies; strengthening healthcare infrastructure; building clinical oncology capacity; and fostering cancer clinical trials in Africa. Home to nearly 200 million people, Nigeria accounts for over 10 percent of cancer deaths on the African continent. Through AAI, BVGH has partnered with the Nigerian Federal Ministry of Health and the country’s leading oncologists to define their cancer priorities, align on treatment guidelines, and create a plan to expand patients’ access to affordable cancer drugs. 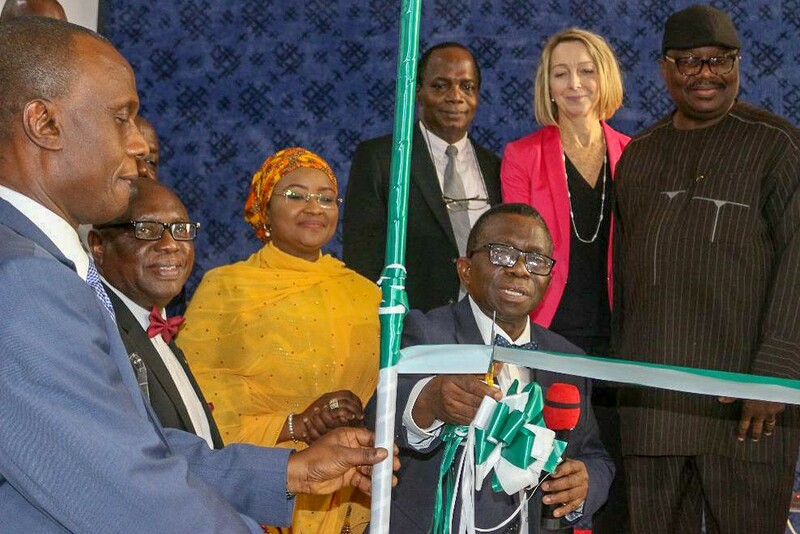 As a result, BVGH and the Honorable Minister of Health, Professor Isaac Adewole, launched a first-of-its-kind request for proposals (RFP) to pharmaceutical companies for prioritized, select cancer drugs. Honorable Minister Adewole asked pharmaceutical company CEOs to partner with Nigeria and commit to providing affordable access to their lifesaving drugs. On the Minister’s behalf, BVGH works with these companies to provide Nigeria with significant price reductions on a variety of gold-standard drugs targeting breast, cervical, colorectal, liver, and prostate cancers. BVGH is now coordinating with the Federal Ministry of Health and cancer hospitals to allocate resources from their budgets and bring new treatment options — and hope — to cancer patients. Africa’s cancer crisis parallels what the USA faced in the 1950s — when cancer invariably meant death. But unlike the past, we now have the tools and technologies to rewrite the cancer narrative. Through collaborative, multi-sector efforts such as AAI, we can reverse cancer mortality patterns on the African continent and bring hope to patients. To learn more about BVGH’s efforts in expanding access to life-saving cancer treatments and technologies, visit their website. BIO Ventures for Global Health (BVGH) is a results-oriented nonprofit dedicated to solving global health issues by forming partnerships with industry.